It's still so pretty out today, and therefore, it's a Halloween tea party on the patio. My table covering is something I made several years ago, from a towel and quilt-as-you-go stockings. 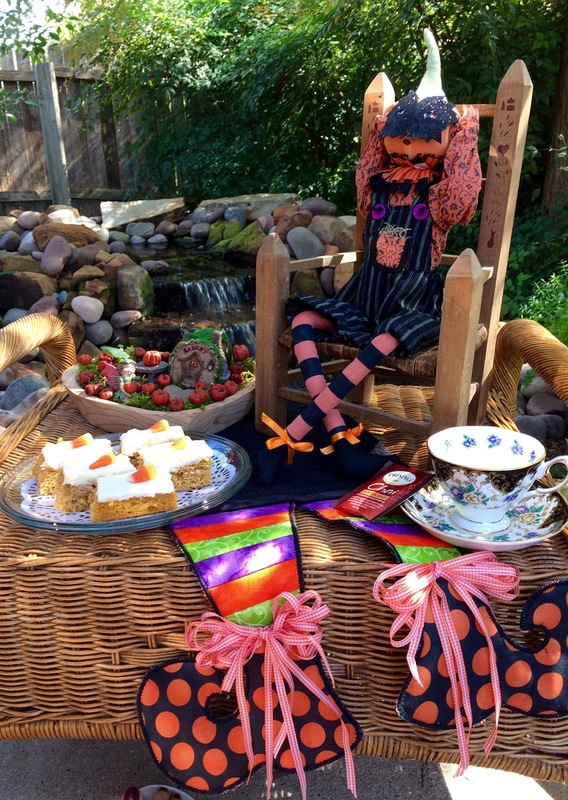 Masked Mr. Pumpkin Head is ready to host the Halloween tea party. 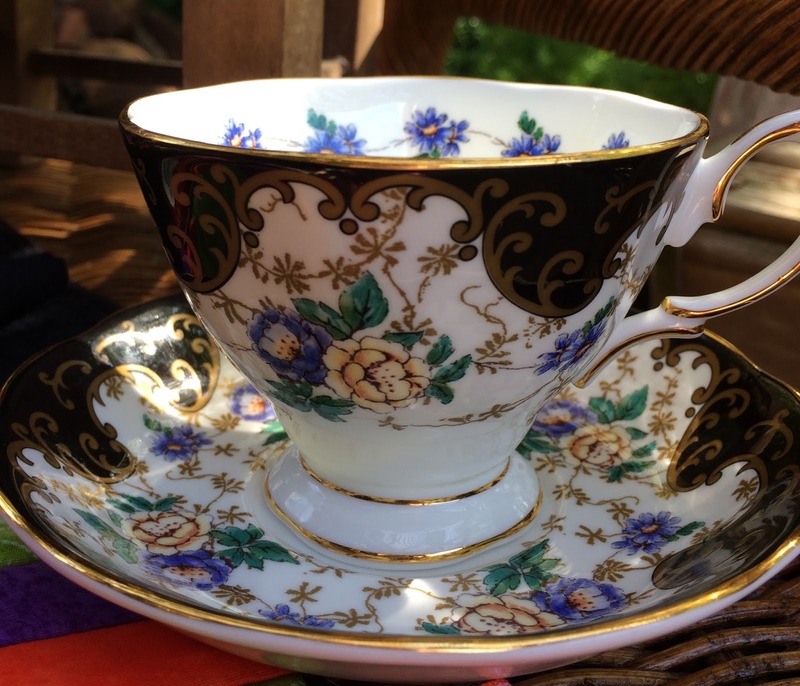 I'm using my Royal Albert Duchess teacup today, and some Twinings pumpkin chai tea, which is perfect for the pumpkin bars. 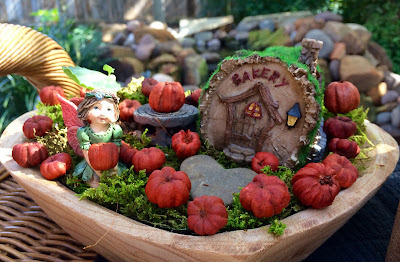 My indoor fairy garden is making an appearance outside for I've made it into a pumpkin patch. Don't you love the Bakery fairy home? I have been making these bars for years! Mix remaining ingredients together and add to creamed mixture. Spread in a greased 10" x 15" pan or for a cake, into a 9" x 13" pan. Bake at 350 degrees for 25-35 minutes, depending on the size of the pan. When Cooled frost with Cream Cheese Frosting. For Frosting: Blend cream cheese and butter well. Gradually add powdered sugar and beat until smooth. Add vanilla and blend well. 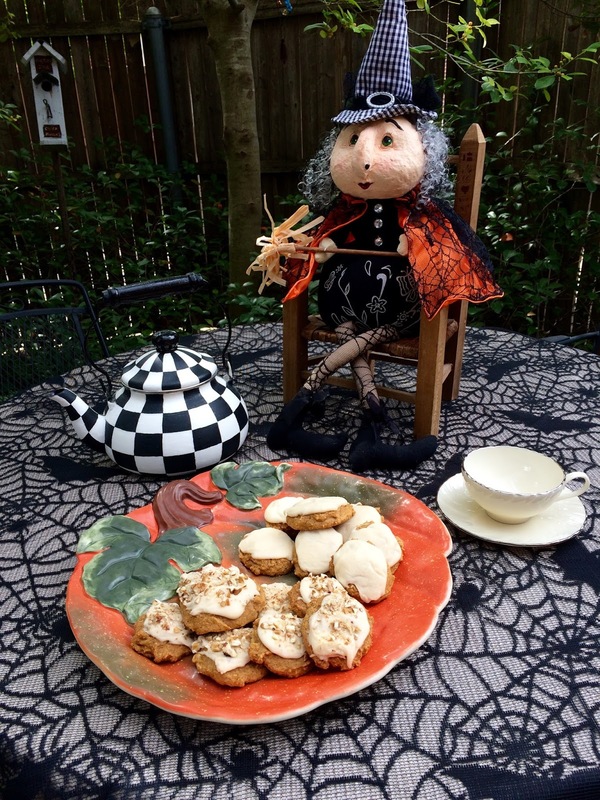 It's another summer-like day here and time for a Friendly Witch Tea in the garden. I'm using this tablecloth that I bought at Ross several years ago. It matches my Friendly Witch's stockings and her cape overlay. 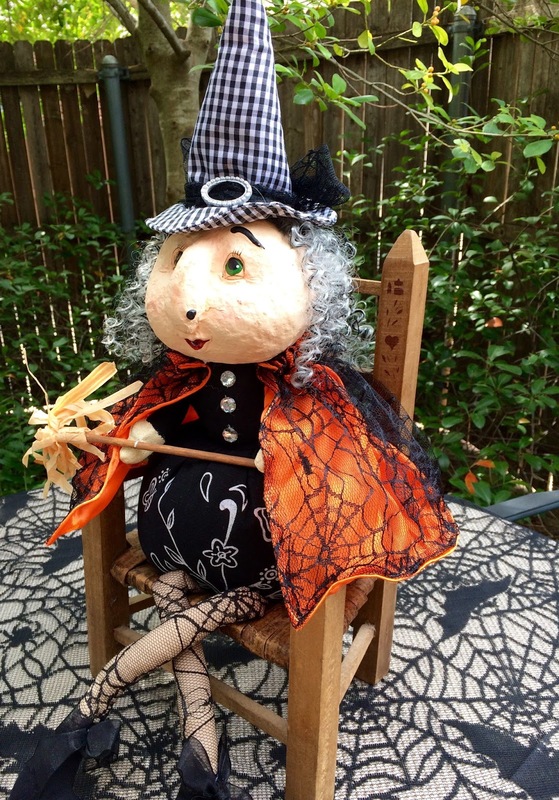 Don't you just love the wart on her nose, and her gingham hat? My Lenox teacup goes with most anything and I received it from Debbie from Stephanie's very first teacup exchange. 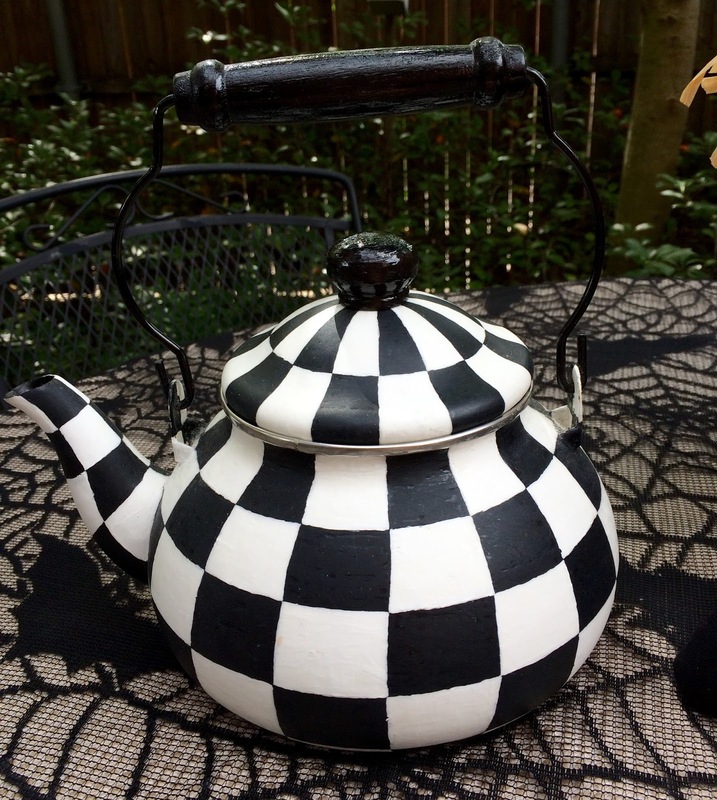 My McKenzie-Child's look alike tea kettle that my son Mike painted for me completes the look! 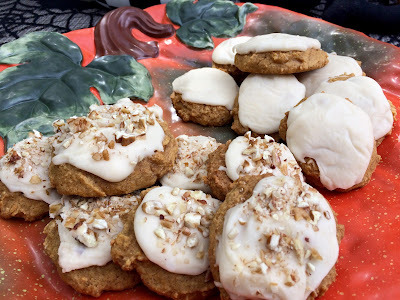 These yummy, cake-like cookies are a perfect Fall treat! Preheat oven to 350 degrees. Line cookie sheets with parchment paper or silpats. In a medium bowl, cream together the butter, and both sugars. Add pumpkin, egg, and vanilla to butter mixture, and beat until creamy. Mix in dry ingredients. 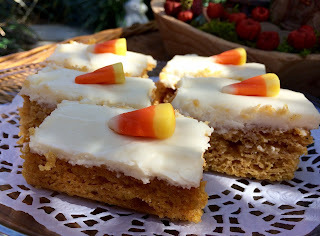 Drop by tablespoonfuls onto prepared cookie sheets, and flatten slightly. Bake for 15-20 minutes. Cool cookies and then frost with Brown Butter Icing. Garnish with the chopped, toasted pecans, if desired. For the Icing: In a medium bowl, place powdered sugar, vanilla and 3 tablespoons of milk. In a 1 quart saucepan, heat 1/3 cup butter over medium heat, stirring constantly, just until light brown. Pour browned butter over powdered sugar mixture. beat until smooth. Gradually add the remaining tablespoon of milk to make frosting creamy and spreadable. 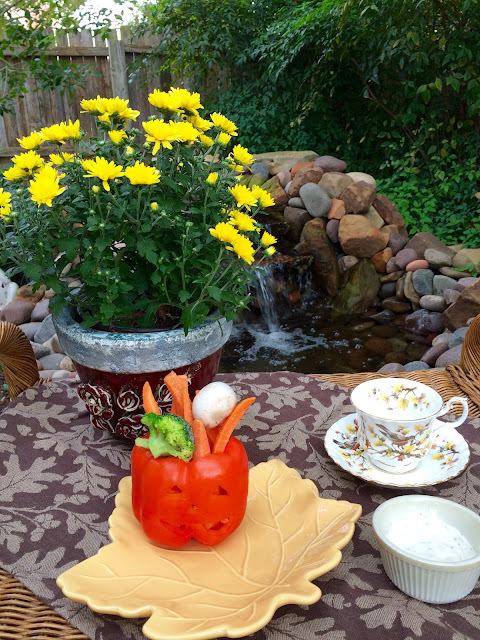 Let's enjoy some veggies and dip with a cup of tea, shall we? 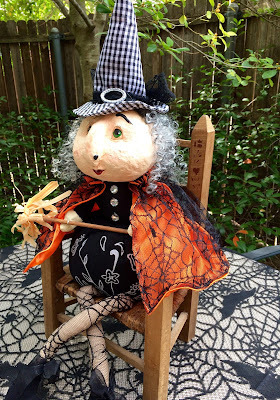 My friend Pat, from Gypsy Heart and Soul shared this adorable Halloween idea, which you can see here. I just had to try it out for myself. My friend, Marsha, from The Better Baker sent me this pretty towel which I'm using for my table covering. 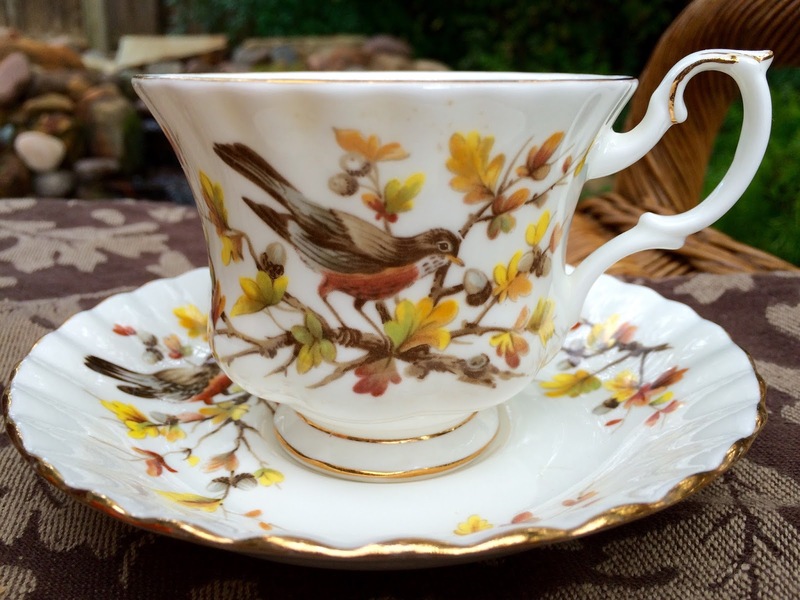 Isn't it perfect with this teacup? My mums are still looking good! Yea!! 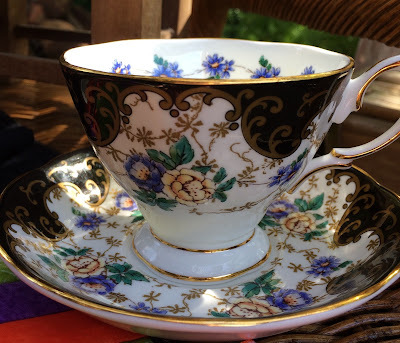 This Royal Albert Woodland Series teacup that my friend Rosie gave me from her late Mother's collection, looks right at home on the towel/table covering. 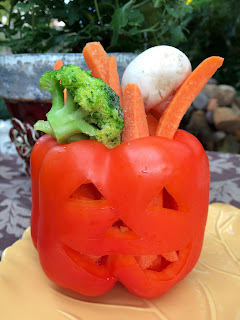 A cute appetizer for a Halloween Party! Carve a face into your pepper with a paring knife to resemble a jack-o-lantern. Fill with an assortment of raw veggies. Serve with dip and enjoy! Let's have tea on the patio today because it's such a pretty, Fall day in Texas! 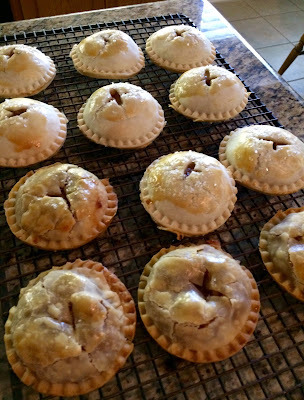 I've made us some mini apple pies to enjoy. Let's have one, shall we? 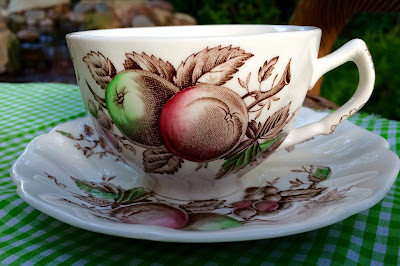 I'm using my Johnson Brothers Harvest Time teacup. Isn't it such a lovely, vintage pattern? These little pies make your home smell delicious! I hope you get a chance to make some soon. 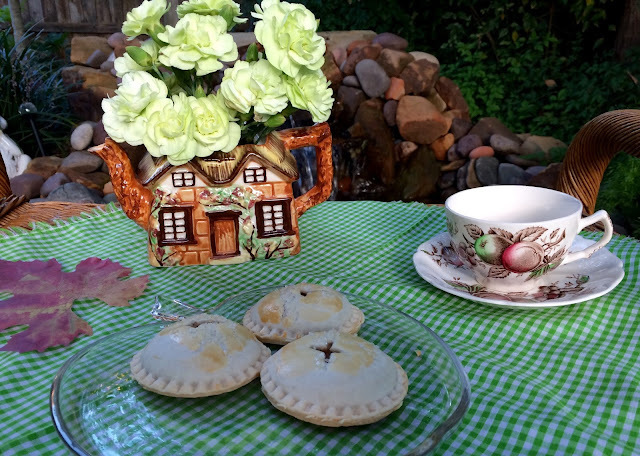 These mini apple pies are the perfect after dinner dessert or teatime treat! Melt the butter in a medium skillet over medium heat. Add the diced apples, spices, and cornstarch. Cook about 3-5 minutes so the apples start to soften and the cornstarch thickens the sauce. Once the apples are almost tender, remove from the heat and let cool to room temperature. Unroll one of the pie crusts and using a rolling pin, roll it out about 1/2 inch larger in diameter, this is to ensure covering the mounds of filling. Unroll the second crust, then spoon on a tablespoon of the apple filling. Repeat around the whole crust, leaving enough space to seal and cut around each mound of filling. You should be able to fit 10 mounds of filling. (I had to use another crust and was able to get 5 more pies). Cut around each of the mounds of filling with a 2 ½ or 3 inch round cutter. I used my Pampered Chef Cut 'n Seal. Lift up each apple pie cookie and place on the lined baking sheet. Press to completely seal the edges on each one, then crimp the edges with a fork. (I didn't need to do this since I used the Cut 'n Seal). Brush the tops with the egg wash, then cut slits in the top of each crust for steam to escape. 10.Bake 15-18 minutes, until golden brown. Hi and welcome to my home! Come on in and I'll show you around. 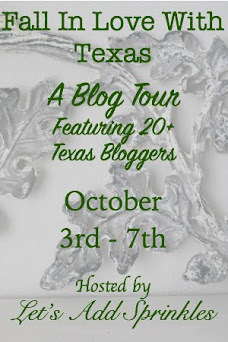 The lovely Katie, from Let's Add Sprinkles has organized this special Fall in Love with Texas Blog Tour, and we appreciate all of her hard work! Let's stop by and grab a cup of tea from my thrifted coffee table that I refinished a couple of years ago. 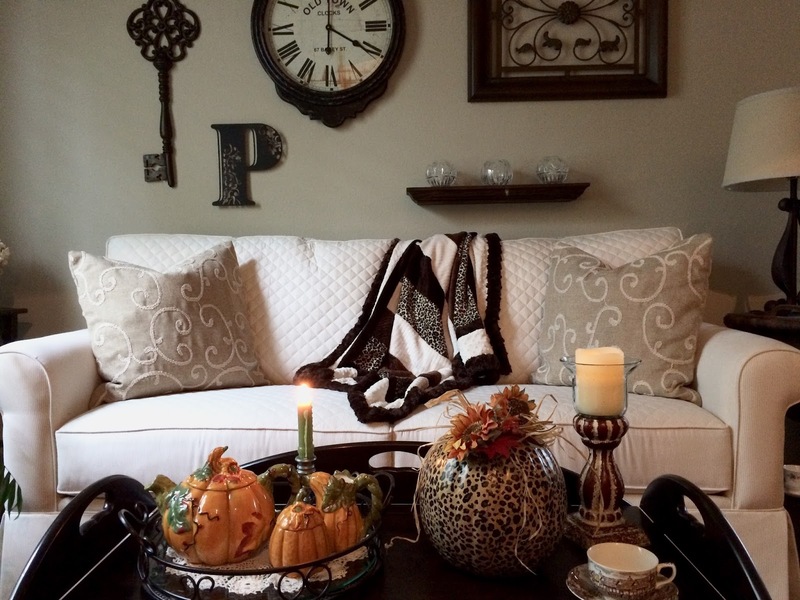 The throw on my sofa is a quilt-as-you-go minky quilt that I made, along with the envelope style pillows. 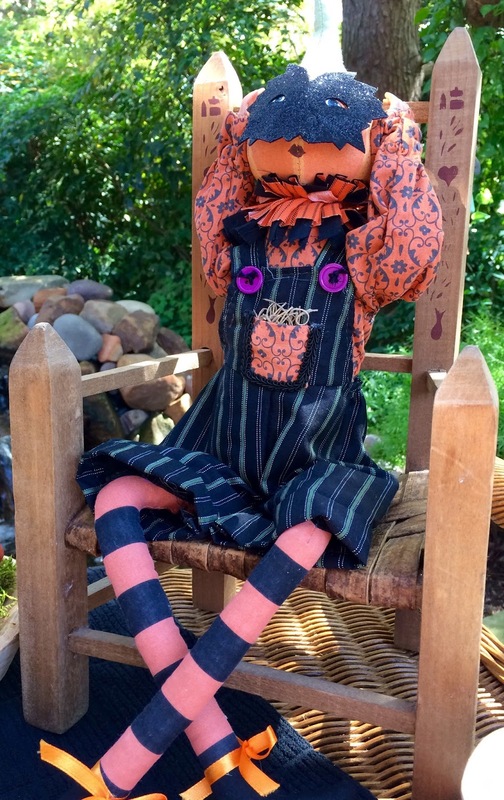 The pumpkin is a mod podge project that a friend and I did several years ago, and it picks up the animal minky print in the throw. My late beloved made this box from old barn wood , and I always keep it on my dining room table, which I change out for the seasons. It's a beautiful reminder of his last Christmas gift for me. As we pass by my kitchen, maybe I could coax you into a bowl of soup? 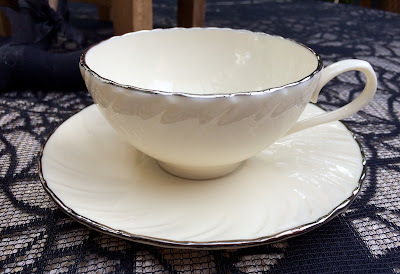 These darling bowls that I found at Home Goods are ones that I always look forward to using in the Fall season. The pumpkin centerpiece was found at Kohl's years ago and I used a garland formed into a circle to sit it on. Tiny lights are entwined and a battery operated candle with a timer makes for a soft glow. My family room coffee table has some handmade, homespun pumpkins, M&M's for the grandkids, and an old crock filled with faux mums. 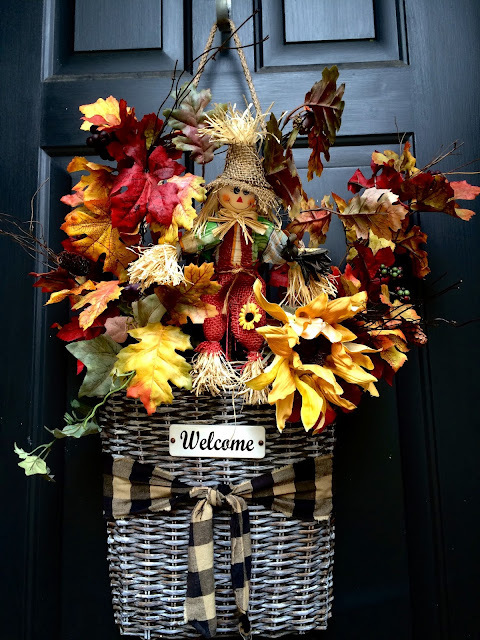 The little squirrel was a gift from a friend, and of course the pine cones add some Fall interest. 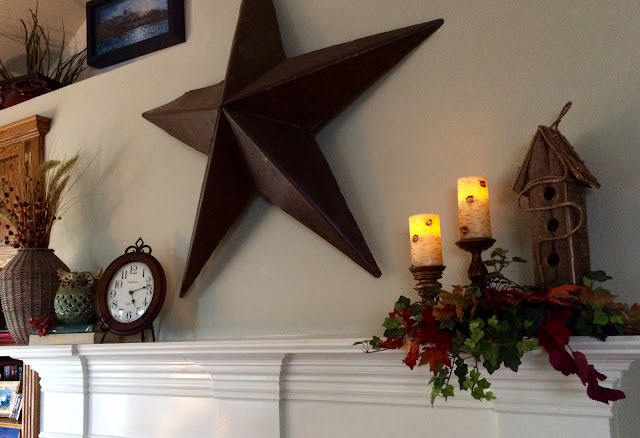 Here's a quick peek at my Fall mantle, which always has the huge iron star in the middle. The birch candles which came from Michael's, were ones that I admired from Linda @ Life and Linda. Linda was kind enough to tell me the source. Don't we love getting ideas from our blogging friends? Before we head outside, you can see my cross stitched seasonal piece and my crocheted pumpkin, that I've placed on my washstand. This washstand was a piece that I dragged down the alley to our newlywed apartment, from an antique shop when my hubby were first married, over 46 years ago. 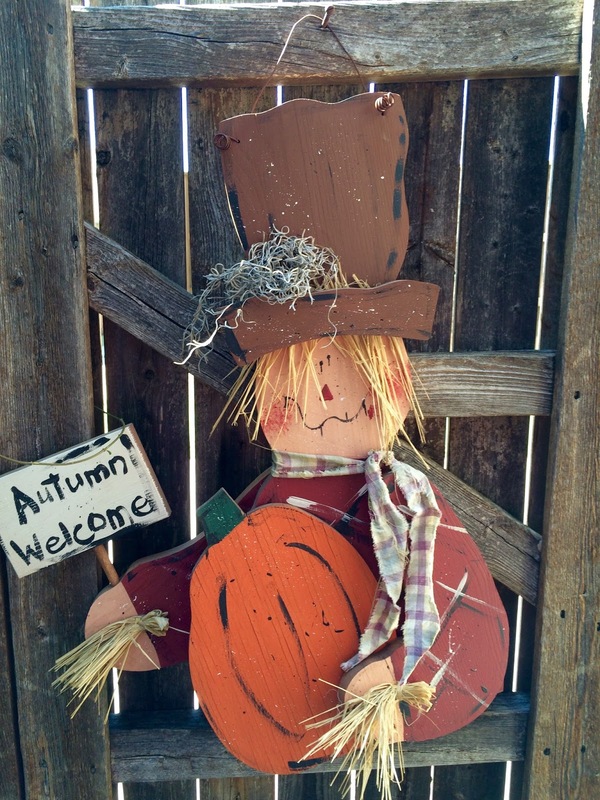 From my back gate, a big Thank you for visiting my Texas home on the Fall in Love with Texas Blog Tour! Dishing It & Digging It! 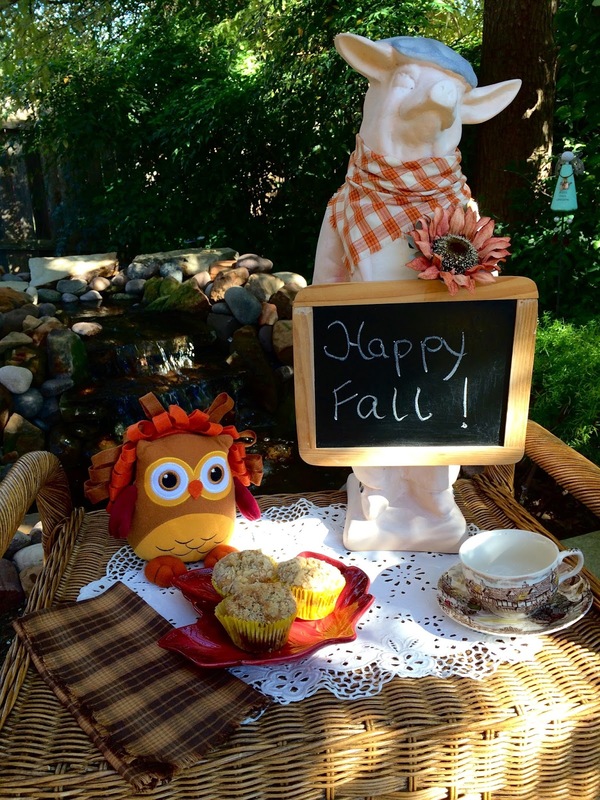 It was such a pretty day that I decided to enjoy a Fall tea outside by my waterfall. My cute owl was gifted to me by my friend, Marsha @ The Better Baker. Thank you, Marsha! 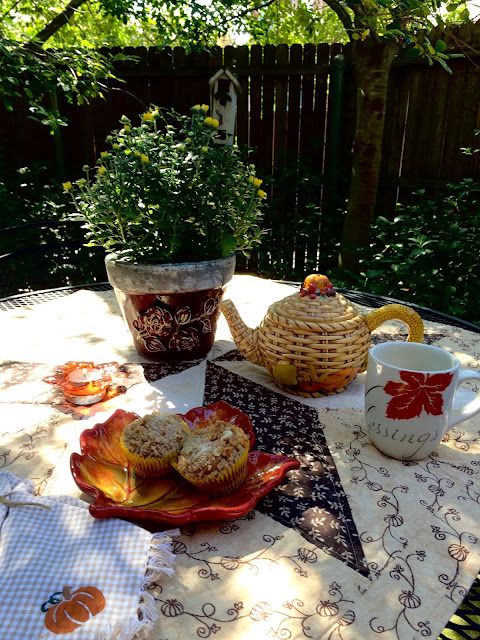 Won't you join me for an Inside-Out Pumpkin Muffin? There's a surprise cream cheese filling inside! You know that Mr. Owl is hoping to get a tasty bite! 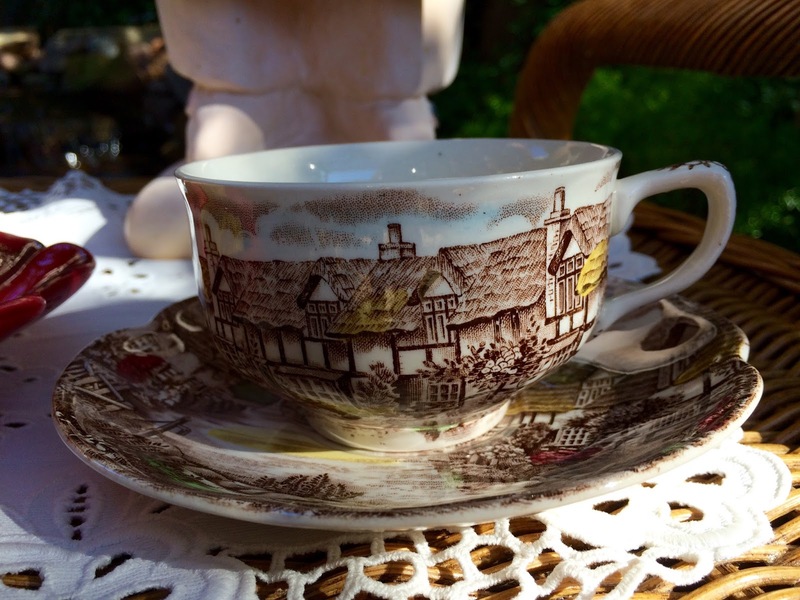 I'm using my Johnson Brothers Olde English Countryside teacup today. I love brown transferware for Fall. 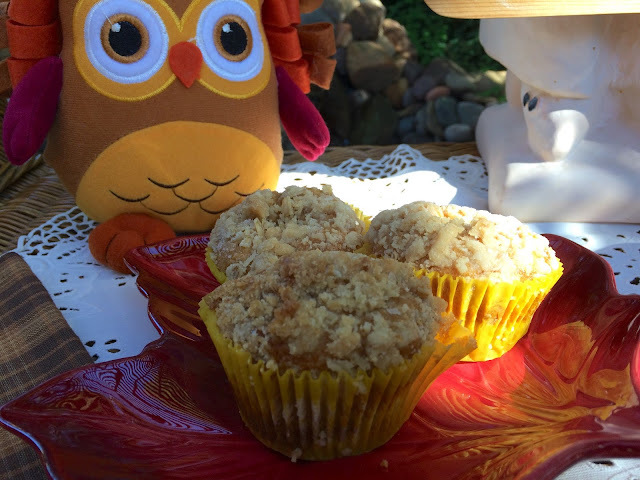 These muffins with the creamy center and streusel topping are a perfect Autumn treat. The recipe comes from King Arthur Flour for their #bakealongchallenge. To make the filling: Make sure the cream cheese is at room temperature. If it's not, place it in a microwave-safe bowl, and heat on low power for 40 seconds, just to soften it. Stir in the sugar and vanilla. To make the batter: Whisk together the pumpkin, eggs, brown sugar, oil, boiled cider (or honey), salt, spices, baking powder, baking soda, and milk. Scrape down the sides and bottom of the bowl. Add the flour and mix until well combined. Scrape down the sides and bottom of the bowl and beat briefly to incorporate the scrapings. Drop a scant 2 tablespoons of the batter (a heaping tablespoon cookie scoop works well here) into each muffin cup, spreading it to cover the bottom. Dollop on a heaping tablespoon of filling, then cover with another 2 tablespoons of batter. Sprinkle each muffin with some of the streusel topping. Bake the muffins for 18 to 20 minutes, until a cake tester inserted towards the edge (not into the filling) comes out crumb-free. Remove the muffins from the oven. As soon as they're cool enough to safely handle, transfer them to a rack to cool completely. Enjoy fresh-baked muffins within 2 to 3 hours; refrigerate up to 3 days for longer storage. Freeze, well-wrapped, up to 3 weeks. Rewarm cold muffins in a preheated 350°F oven, tented with foil. Or heat briefly in a microwave set at low power.